The right rug can transform your space, adding both comfort and style. Miles Kimball offers a wide range of rugs in a variety of styles, colors, and textures, making it easy to find one to suit your home. Designed to stand up to heavy foot traffic, our heavy-duty all-season runner protects your floors and prevents accidental slips with its thick, absorbent material non-slip backing. These three braided rugs are crafted in a calming blue shade that works beautifully in any room. With a contemporary, geometric design and four color options, our Starburst Rug is a versatile addition that can complement any room. The unique shape and beautiful texture of the Solid Braided Slice Rug make it a perfect entryway accent. This trio of durable, stylish rugs are reversible for double the value. This three-piece set offers excellent value and long-lasting durability. Add comfort and classic style with three beautifully textured rugs in a neutral, dual-tone design. This playful rug is sure to put a smile on your face with its sweet, colorful design. Add personality to any space with this machine-washable accent rug. Enhance your holiday décor with this charming accent rug. Browse accent rugs, runners, and more from Miles Kimball to find the perfect stylish addition for every space. Miles Kimball’s after-holiday clearance offers a wide selection of our most popular winter products at our lowest-ever prices, so you can find all your favorites while sticking to your shopping budget. Our holiday clearance includes a unique variety of items including decorative accents, holiday cards, holiday storage bags, pull-up trees, holiday décor, and more. You’ll find plenty of money-saving deals on one-of-a-kind items you’ll love, with incredible discounts that slash prices up to 75 percent. 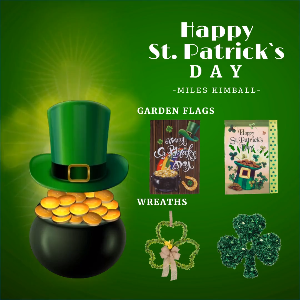 At Miles Kimball, we pride ourselves on gathering a collection of high-quality, unique items in one easy-to-shop place, making it easy for our customers to find affordable products of all kinds. Shopping for a special gift for a loved one or friend? Our rock-bottom holiday clearance prices mean you’ll be able to get more for your money, putting together a truly wow-worthy gift that’s sure to make an impression. Plus, with an inventory of hard-to-find products you won’t see anywhere else, you can be sure that any gift item you choose will stand out as something special. Shopping our after-holiday clearance is a smart way to find the perfect pieces to refresh your home in time for spring, all while enjoying the added benefit of major savings. Breath new life into your space with our variety of decorative accents, garden flags, wall art, and more. Or, stock up on décor, storage, and gift wrap for next holiday season, saving yourself the time and money of the winter shopping rush. Whether you’re hoping to add a stylish touch to your space, find the perfect gift, or stock up on home essentials, Miles Kimball has the products you’re searching for at prices you won’t believe.